To this point, the Yankees' company line has been that a division title, not the Wild Card title, is their immediate goal. It was hard to believe them, however, while watching Sergio Mitre pitch in extra innings on Monday while Joba Chamberlain enjoyed his third consecutive day off. 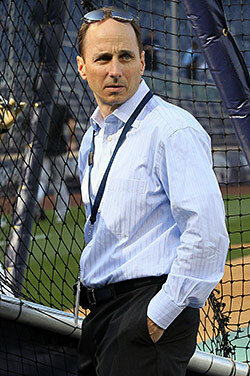 So now Brian Cashman has clarified the team's stance to Newsday, sort of. "We don't have to win these series at all costs," Cashman said by phone Thursday. "We're in this thing to win a World Series. Our focus is a World Series, not 10 years from now being known as division champions. If you're not World Series champions, nothing else matters. Nobody really remembers." Cashman's basic point: They're going to manage their roster with an eye toward being ready for October, and if that comes at the cost of some games in September, so be it. Again, in his words: "We do care about winning [the division]. But do you want to run your bullpen into the ground for games this week or do you want to make sure guys are healthy for the entire run? I'd rather be where we're currently sitting and be healthy for the entire run." It's worth noting that their postseason spot isn't completely locked up yet. Boston's currently six back with sixteen to play, and while that still a lot of ground to make up in just over two weeks, they do play the Yankees six more times. (For more reading on the subject, we direct you to pieces titled "Congratulations Yankees, You've Just Let The Red Sox Back Into The Post-Season Chase!" and "September skid puts Yankees' playoff berth in jeopardy.") It's not quite time to panic yet — after all, they're still just a half-game out of first, and Andy Pettitte finally returns to the rotation on Sunday. For right now, just breathe, and watch A.J. Burnett pitch in tonight's series opener in Baltimore, against Kevin Millwood.